Complete adventure mode in co-op. Spend 1,000,000 gold in the shop. Complete adventure mode on easy or normal. Hit the Yeti's face with snow chunks 3 times. Have a 4x coin combo multiplier lasting over 30 seconds. Get a 5x bounce combo on boss PH4N-T5M 1.0. Buy 20 different heads for Rex. Collect every coin in every level. With a 4x combo collect a ruby. Use death to your advantage in Cold Front. Beat a level in Co-op mode. Beat Adventure mode in under 3 hours and get every star and hidden package. Get 3 stars on all 4 bosses. Beat the target time for a level without using Jump. Beat the target time for a level without using Dash, Drop or Rocket. Beat P1ng in less than 10 seconds. Collect all the hidden items. Cover a level in ash. Kill the Big Globowski in under 30 seconds. Complete the RageQuit Rex mode. Use the shortcut for a photo finish in Scrollway. Spend 100,000 gold in the shop. Use your projectile to trigger 75% of the switches in Power Core. Buy 30 different skin colors for Rex. Destroy 25 snowballs in Snowblind without dying. Destroy 100 fireseeds in Jungle Jump. Stun the patroller in P1ng 3 times in one run. Buy 30 different jet stream colors for Rex. 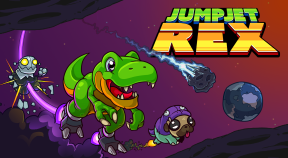 Buy 20 pairs of jumpboots for Rex. Get 3 stars on 30 levels. Complete the SpeedRun mode and post a time to the leaderboard. Retry a level 30 times. Score a 3 point shot in Holoball in the Rexercise Room.